MK Lipman's push to ease driver's license transfer notches two successes, as theory test is removed and IDF service addressed. Good news for new olim (immigrants to Israel) - the headache of turning your foreign driver's license into an Israeli driver's license just got easier. MK Dov Lipman (Yesh Atid), himself an immigrant from America, has been pushing for an automatic transfer of licenses for immigrant drivers without the high fees and bureaucracy. Lipman welcomed initial victories at a recent session of the Committee for Absorption and Immigration, which is chaired by MK Yoel Razbozov (Yesh Atid). As a result of the meeting, it was decided that olim will not be required to take a theory test in Hebrew if they fail the practical driving test to transfer their license twice, in a move overturning protocols from 2006. 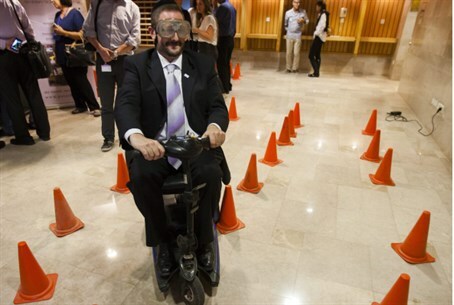 Lipman argued to transportation ministry officials that the theory test in Hebrew was an unfair obstacle many olim could not overcome. It was also decided to consider extending the period of transferring the license beyond three years from arriving in Israel for olim who enlisted in the IDF. Lipman had requested that the time spent carrying out mandatory service to the nation not be included in the three years. "Over the last few months I have received many complaints from olim having difficulties switching their licenses after driving decades in western countries," commented Lipman. "The regulations made no sense." Lipman noted in the meeting that olim are allowed to drive for a year on Israeli roads without transferring their licenses, pointing out the flawed logic of demanding theory tests and complicated transfer processes from drivers already considered safe enough to be on the road. "I am proud of these two achievements. It will make a difference in the lives of olim who have been struggling with senseless bureaucracy," added Lipman. Razbozov took an opportunity after the meeting to "thank MK Lipman for raising this issue," adding that he would like to thank the Ministry of Transportation "for following this committee's decision and canceling the need to take a theory test after two failed road tests." "We need to remember that even though some of the olim might be new, they are very experienced drivers that have a hard time navigating the bureaucracy. This decision will benefit these olim, and allow them to be more successful and independent," concluded Razbozov.